Scavenged soundings: music, sound and technology looks at the fundamental essence of music creation through its tools, by examining the concept of instruments as technology and exploring how these technologies facilitate our interactions and expressions through sound and space. 'Scavenged soundings' is for those interested in open-form, group interactions of an auditory nature, and requires no musical training or experience. The only requirements are an open mind, a willingness to communicate, and a sense of humour and the absurd. In this workshop, participants will examine the history of technology as it relates to sound making and musical expression. This will be an open discussion with some prepared audio + video clips, taking the angle that "technology" should be both demystified and deconstructed. Afterwards, participants will develop a 'technology' to be used for sound expression. We will explore the urban landscape around Access Space for found materials, trash, and other oddities. Participants will build some sort of music-related technology - an instrument, a means for composing or improvising, or even something to aid in listening. We will then explore the art of musical expression through our tools, seeking ways to evoke imagery, sensations and narrative through these unconventional 'instruments'. Emphasis will be placed on listening, interaction and expression. What does it "mean" to make a sound this way, or that way? What stories do these sounds tell about who we are? How does the technology enhance or challenge these expressions? How can we, as a group, create a collective form of expression? Finally, a small concert of the entire group will occur in the Do it Anyway performance slot between 16:30 - 17:30. David Birchall is a musician living in Manchester who has run sound art/improvising/instrument building workshops for various organisations including Z Arts, Bury Library Service, Unity House, Manchester NHS, Huddersfield Contemporary Music Festival and the Tour De France. He plays solo guitar and has collaborated in or with Chastity Potatoe, Desmadrados Soldados de Ventura, Levenshulme Bicycle Orchestra, Kalbakken, Andrew Cheetham, Sam Andreae, Rogier Smal, Olie Brice, Toby Delius, Mark Sanders, Richard Scott, Philip Marks, Rhys Chatham and with many dancers, performers, filmmakers and visual artists. His music has been broadcast on BBC1, BBC Radio 1, BBC Radio 6 Music and Resonance FM. Fiona Kennedy is the co-founder of Sheffield's Singing Knives label and performs music in various guises, including Blue Yodel, the Hunter Gracchus, and others. She is also a producer of the Sheffield Live! Community TV programme Peak Signal 2 Noise. John W. Fail is a member of Pixelache Helsinki and co-director of the 2015 festival in September. 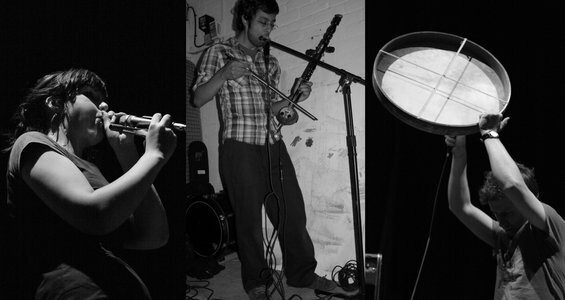 He ran the Ptarmigan project from 2009-2014 and has recorded and performed in various experimental and improvised musical projects. Protocol: This workshop should begin with some introductory exercises, just to get the group acquainted and warmed up. 'Scavenged Soundings' is very much about exploring public space and finding objects to be turned into sound-making instruments. So the workshop is somewhat mobile, and this can be done by splitting into smaller groups and going in different directions, or all at once, depending on the number of participants. The faciliator(s) is/are really just there to make people feel comfortable and at-ease, and to introduce some improvisation-based listening/playing structures. The John Stevens "Search and Reflect" book was used in the Do It Anyway version of this workshop and a few exercises were attempted from here. This is not necessary, but some participants may want more guidance than pure 100% collective improvisation, and thus setting some boundaries (such as time/duration-based, or arbitrary based on the group demographics) can be helpful. It can be nice to bring objects back to the workshop meeting space, as they will take on different sonic properties in different environments. The facilitator(s) is/are free to design a summary project, such as a "composition" or group performance at the end. Resources needed: Ears, eyes, feet, and an open mind. The workshop is designed specifically to avoid traditional musical instrumentation, so unless you are bringing some texts or exercises (see 'protocol' below), it's almost essential to have NO resources for this. All of the sound-making devices in this workshop should be found during the workshop itself.